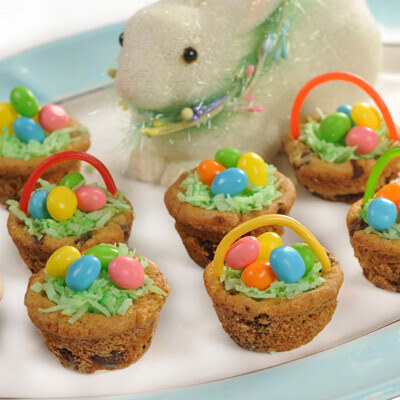 These adorable Chocolate Chip Easter Baskets are a special springtime treat to be remembered. PREHEAT oven to 350° F. Grease and flour 24 mini-muffin cups. Place one square of cookie dough into each cup. BAKE for 14 to 17 minutes or until golden brown. Remove pans to wire rack. If licorice handles are to be added, with tip of wooden pick, make two holes opposite each other on top edge of cup. Make sure holes are the same size as the width of the licorice. This is best done when cups are very warm. Cool cups completely in pans on wire rack. With tip of butter knife, remove cookie cups from muffin pans. Arrange on serving platter. COMBINE frosting and a few drops of food coloring in small bowl, adding additional food coloring until desired shade is reached. DISSOLVE a few drops of food coloring in 1/4 teaspoon water in small, resealable food storage plastic bag. Add coconut. Seal bag and shake to evenly coat coconut. SPOON a small amount of frosting onto the top of each cup. Add a pinch of tinted coconut. Top grass with SweeTarts Jelly Beans. Insert ends of licorice into small holes in cups for handles.